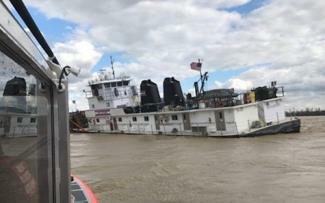 The U.S. Army Corps of Engineers is working to regulate barge traffic downstream along the Mississippi River that is running at a high level. The Ohio River has released unseasonable quantities of water into the Mississippi at their junction in Cairo, IL. An accident near Louisville, KY in December restricted traffic. In 2018 almost half the exported grain passed through terminals on the lower Mississippi below Baton Rouge LA. Generally problems involving barge transport occur during prolonged dry periods that restrict passage of loaded barges passing downstream due to insufficient draft in channels. It is anticipated that the problem will be soon resolved although the full effect of ice melting in the upper reaches of the Mississippi and its tributaries has yet to be experienced.